In through-tool coolant systems, each cutting tool requires a different coolant flow in order to achieve its optimum pre-set pressure. 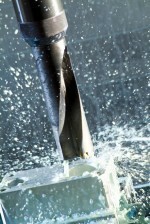 Conventional high pressure coolant pumps tend to be sized to meet the requirements of the largest cutting tool, for smaller tools these pumps merely bypass all or excess cutting fluid back to the sump, wasting energy which is dissipated as heat, warming the coolant itself, often necessitating the use of chillers. Wanner says the Hydra-Cell Intelligent Pump succeeds by delivering the right amount of coolant for each tool in the carouse automatically. No energy wasting coolant bypass is necessary. WANNER INTERNATIONAL says that although positive displacement pumps are unquestionably more energy efficient than multistage centrifugal pumps, not all positive displacement pumps are equal in that respect. WANNER has launched the Hydra-Cell T8030, a Triplex diaphragm pump that it claims eliminates leaks, hazards and the expense associated with replacing seals and packing.